Hi I am so excited to share today's card. The reason for this excitement? My friend Christine Drogt has started her own line of stamps. I am a huge fan of Christine's work. Not only is she talented...she is one of the sweetest people I know! Her images are adorable and you can get a couple of them in digital format right now to play with. Just head over to the Create A Smile blog and right click them to save the image and create away. While you are there make sure to click over to her Facebook page, click LIKE and then click GET NOTIFICATIONS. You won't want to miss all she has planned. Now for today's card....I chose her little monster. I love him. He is just fun! I decided to import him into my Silhouette Studio and create a cut file with him. I cut him out of DCWV glitter paper. 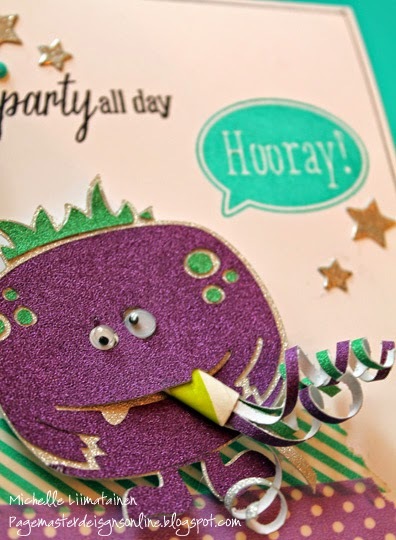 I used silver, green and purple glitter paper & some googly eyes to bring him to life. Seen as this card is for a graduation party I decided to add some party flair to him. I took a paper straw, cut it down and cut strips of the silver, green and purple glitter paper. I filled the end of the straw with glossy accents and then I wrapped the strips around the end of a hole poker to give them curl and stuck them in the straw. I added 2 pieces of Washi tape to the bottom and some Hero Arts sentiments to finish it off. The stars are left over stars from the new Hero Arts die Star Die. Here's a close look at our party animal. I hope you stop by Create a Smile and pick up both of her free digi's. I would love to see what you do with them. 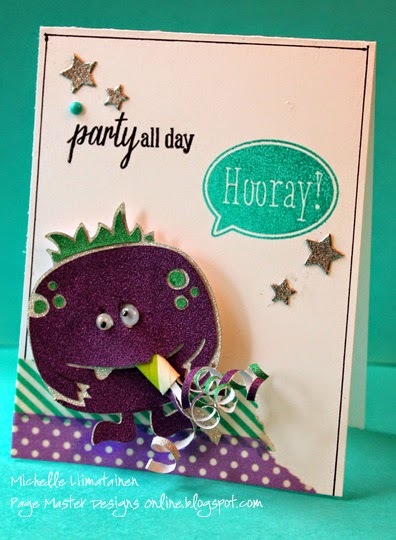 Totally adorable....I especially love that Purple Monster....so cute. Hpe you are fine and well and settled into your new place. I knew you were moving, last time we chatted and now forget if you are still in Salem. Would love to get together some time, but will school almost over, it may be too hard for you -- Let me know and please take care!! Wow, this must be my favorite take in the monster! This is so cool! Sinply wonderful! Love what comes out of his mouth....! Wow, Michelle, this is so cool! !